This woven ring adds an instant touch of brilliance to your wardrobe and makes a bold statement with its striking radiance and layers of effortless vivacity. 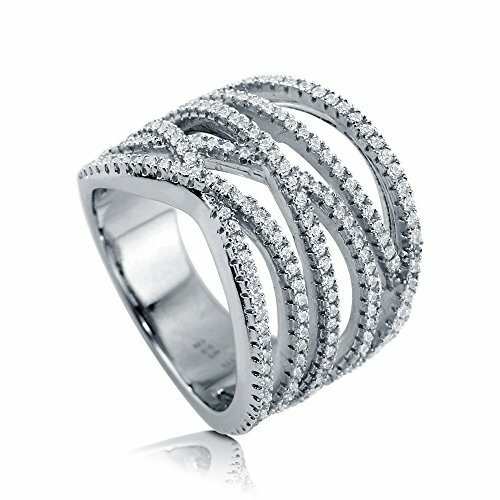 Made of rhodium plated fine 925 sterling silver. Set with 0.955 carat round cut clear Swarovski zirconia (1mm) in micro pave setting. Band measures 6mm - 20mm in width. Imported. Size Tips! This ring's band width is wide, so we suggest you choose a ring size 1/2 or 1 size larger than your standard ring size to make sure the ring will fit comfortably. METAL: rhodium plated .925 sterling silver, stamped 925, high polished finish, nickel free. RING BAND WIDTH: 6mm - 20mm. SIZING TIPS: This ring's band width is wide, so we suggest you choose a ring size 1/2 or 1 size larger than your standard ring size to make sure the ring wil fit comfortably. PREMIUM QUALITY STONE: Main Stone: 0.955 carat round cut clear Swarovski zirconia (1mm). STYLE: This woven ring adds an instant touch of brilliance to your wardrobe and makes a bold statement with its striking radiance and layers of effortless vivacity. STYLE: Statement - Turn heads with this statement style. Cocktail - This cocktail ring will amplify your look with brilliant glam.